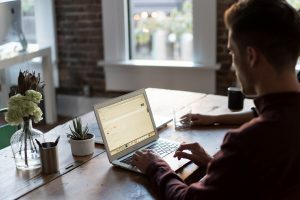 For one, although working from home may be effective for many, most people are likely to get distracted under these conditions. For example, a former manager of mine once delegated a writing task to me and instructed me to complete it at home. When I went to engage the project, I found it difficult to stay focused in an environment I traditionally relaxed in, and as a result the quality of my work suffered. My experience clearly shows that for people like myself, working from home is disadvantageous to productivity. In addition to this, the stay-at-home worker often finds it challenging to distance themselves from their work, and this can be mentally exhausting. For instance, a colleague of mine started his own business from home. Within the first few months, he was receiving telephone calls, emails and faxes at all times of the day and night. In the end, he felt forced to migrate this professional pursuit to a rented office apartment simply because it was taking over his life. As this story illustrates, the disadvantages of a home-based job are numerous. To conclude, despite advantages of lower overhead and independence, working from home has many more drawbacks than favourable points. It is thus hoped that professionals everywhere think carefully before settling on this working arrangement. Previous Post In achieving personal happiness, our relationships with other people (family, friends, colleagues) are more important than anything else. Issues such as work and wealth take second place. Argue in support of this claim. Next Post Being a celebrity- such as a famous film star or sports personality brings problems as well as benefits. Do you think that being a celebrity brings more benefits or more problems?